Roti is originally a Hindi word and is the common name for all forms of bread in large parts of India, Pakistan, Indonesia and all of Malaysia. 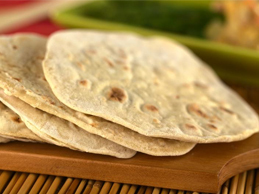 More specifically, this means only the unripe flat Indian loaves such as the Indian naan, aalu paratha and chapati. In Thailand, roti usually refers only to pancake-like types of bread but often to the risen bread (depending on who they speak) while kanom paang (“kanom” means pasta and “paang” is derived from the French word “pain”) only denotes on leavened bread. This type of flat bread is already in the Neolithic. In the case of the area where North India and South Pakistan are now located, this period began around 7000 BC. The Indian variants of roti are gaining popularity in all countries where groups of Indian immigrants have settled: Canada, Guyana, Malaysia, Suriname, Trinidad and Tobago, United Kingdom, etc. In Suriname, it is now no longer only eaten by the Indo-Surinamese, but it is popular among all population groups. In the Netherlands, it has become a popular takeaway since the emigration waves from Suriname to the Netherlands in the mid-seventies. With the emigration of Hindustani from India to Suriname, the roti came along. The “pancake” that is called roti in Suriname (also in the Netherlands) is also called chapati in India. It is a kind of unsweetened bread pancake that can have various additives: in the Surinamese variant mostly ground yellow split peas (roti dalbharie) or potatoes (roti alubharie) and with flavoring such as cumin and chili pepper. For the preparation, balls of dough (possibly with additional ingredients) are rolled out into thin “pancakes” that are baked on a so-called roti plate. The Surinamese roti is served with a number of side dishes such as garter, potatoes, hard boiled eggs, garlic, onion and various types of meat (chicken, duck, sheep), which side dishes are usually seasoned with masala, a mixture of ground spices similar to curry. Roti is not eaten with tomato in Suriname. It is customary to eat the roti with your hands.One breaks off a piece of the rotation to eat and grabbed the rest piece of roti in hand. Roti Wraps, which can also be eaten with a fork and knife, are on the rise. © 2019 Noffoods. All Rights Reserved.